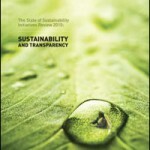 The State of Sustainability Initiatives Review 2010: Sustainability and Transparency was issued by the International Institute for Sustainable Development (IISD) and International Institute for Environment and Development (IIED) in conjunction with other partners and collaborators. It compares characteristics and provides market trends for ten “voluntary sustainability initiatives” in the forestry, coffee, tea, cocoa and banana sectors. These include the familiar coffee certification schemes of Rainforest Alliance, Utz Certified, organic, and Fair Trade. Also included is 4C Code of Conduct compliant coffee, the bottom rung of coffee production standards (you can read more about them in this post). The Review reports that as of 2009, there were 457,756 metric tons of sustainable coffee sold in the world, or about 8% of global exports. Below this is depicted graphically. The “private sustainability initiatives” are Starbucks CAFE Practices and the Nespresso AAA Sustainable Quality Program. 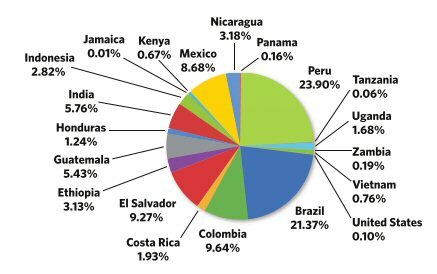 The document goes on to note, however, that the supply of sustainable coffee is actually 17% of global production (1,243,257 metric tons). Due to a variety of factors related to variations in quality, the timing of demand, and the additional licensing, marketing and product costs associated with carrying compliant or certified coffee through the supply chain as sustainable coffee, more sustainable coffee is produced than is actually sold as sustainable. This situation is not new, and has puzzled me for some time, at least in the context of why large corporate coffee roasters, like Kraft and Nestlé, don’t increase the amount of sustainably-grown coffee they buy. A perennial sore spot among many sustainable coffee proponents and Rainforest Alliance, for instance, is that there doesn’t seem to be any increase in the proportion of certified beans in corporate-owned coffee brands; they sit at the minimum of 30% certified beans. The explanation I usually hear is that there isn’t enough supply for that proportion to grow, yet it appears that there is (see more here). Perhaps I’m missing something. Although, as the report points out, just the act of producing coffee in a sustainable manner has positive impacts in growing communities, without the added benefits of enhanced income and/or access to markets, there is less incentive for farmers to utilize these methods. Presumably, a chunk of the onus is on the consumer to be willing to seek out and pay more for this coffee. I’ve flogged that pony before (here for example). Market share information was provided for the past five years, although not every scheme has been around that long. For those in coffee that have existed at least four years, Rainforest Alliance had the highest annual growth rate at 64%, with both Utz and Fair Trade at 30%. Speaking of Rainforest Alliance, there was this graph breaking down certified area by country. There were similar graphs for Utz Certified (top three producers were Brazil, Vietnam, and Colombia) and Fair Trade (Peru, Colombia, and Brazil); organic and 4C coffees were only broken down regionally. It would be interesting to see these reconfigured as percent of each country’s production. There was also a wealth of data on other aspects such as certification costs and premiums to growers. There were detailed comparisons of and various characteristics including income sources, chain of custody methods, and governance (the charts on page 39 showing board representation by stakeholder and geographic region was quite an eye-opener). In an upcoming post I’ll look at similar data from another perspective: how much of this sustainably-grown, certified coffee is purchased by the each of the world’s top ten major coffee buyers. Thanks again for pre-digesting this excellent resource for all of us! I have finally had a chance to read through the coffee chapter and wanted to follow up on one point raised here and in the report. There is no question that sustainable production practices have positive impacts on growing communities even when not tied to sustainable trading relationships. The concern, of course, is that the commitment to these practices is less reliable in the absence of the incentives — premiums, access to services and markets, etc. — that come only when those practices are recognized by the market. We are working with many farmers in El Salvador who farm organically but don’t bother to certify their practices or seek the premiums they can earn through certification. I fear that in markets like this one, the incentive is to adopt unsustainable practices that will boost productivity over the short term to “cash in on” high market prices. In other parts of El Salvador and in Nicaragua, we are struggling to help keep farmers certified organic for precisely this reason. Another part of the report you don’t mention here gives me even more concern: that most premiums are just 5-10 cents per pound. Yikes! With rumors of $4-a-pound prices by early 2011, I am afraid a nickel-a-pound premium might not be enough to keep people farming sustainably! I am publishing next week the results of some research in Colombia that look at just what happens to premiums when NY “C” prices are high, and it is not pretty! According to reports, Colombian coffee farms were badly hurt by the changing weather conditions there and growing temperatures and rain bring pests and damage the crops. The prices of coffee, in turn, keep increasing. Thus, soaring coffee prices are a result of demand/supply factors. On the other hand, there are reports suggesting that the reason of increasing coffee prices are because of intervention of Wall Street speculators driving up dramatically the prices of coffee. So, according to your research, what indeed is at play here? Both diminished supply (due to weather and increased demand, especially from emerging markets like China and India) as well speculation have influenced the market price of commodity coffee.